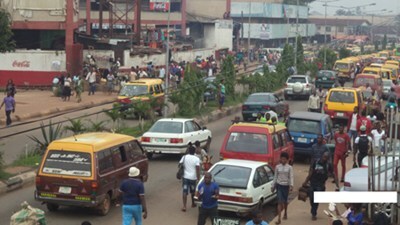 There was disarray during the weekend at Oba Market Benin after a 23-year-old hair dresser named Miss Faith Idehen, had her left ear bitten off by her Landlord’s daughter. According to a report by Vanguard, trouble started when the landlord’s daughter demanded for N1,500, being the monthly payment for electricity bill. The hairdresser pleaded that she did not have up to that amount, but deposited N1,000 with a promise to pay the balance of N500 later in the day. She then left the compound and boarded a commercial bus to her place of work at Oba Market. Unknown to her, the landlord’s daughter allegedly trailed, caught up with her at the popular Yanga Fish Market and pounced on her. Faith was reported to have fainted as she bled profusely from her left ear before passers-by and onlookers rescued her from the grip of her attacker, who threatened to deal with her entire family as she was rushed to Central Hospital. Over a balance of #500? Na wa. She was eventually arrested by policemen after a 24-hour siege was laid to her residence & a Police source confirmed to Vanguard that the suspect would be charged to court for alleged assault and attempted murder.